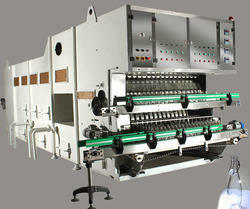 Providing you the best range of automatic glass bottle washer with effective & timely delivery. Automatic Bottle Washer is designed for high output and for cleaning very dirty bottles with labels and foils. It has 3 to 4 multisoak tanks for intensive soak of the bottles and spraying inside, outside with high pressure sprays. The movement of the main carrier chain is continuous, giving high spraying and soaking times. The in-feed of bottles is with automatic auto-loader and out-feed by CAM system.